This past summer I spied an abandoned pallet in a nearby empty lot. I figured when the time was right, I'd pull it apart and make a Christmas sign with it. But, as luck would have it, when I was ready to get it, I lifted it up and there was a yellow jackets nest clinging to the underside. Drat. Pam from Our Adventures in Home Improvement shared this idea a while back and I was excited to try it out. She does a great step by step tutorial. First I purchased some pickets. Then, I soaked steel wool in apple cider vinegar for a few minutes and rubbed it on the boards. Within minutes I had what you see in the first photo! So fun! Thanks for the inspiration Pam! I agree that gloves are imperative for this project. 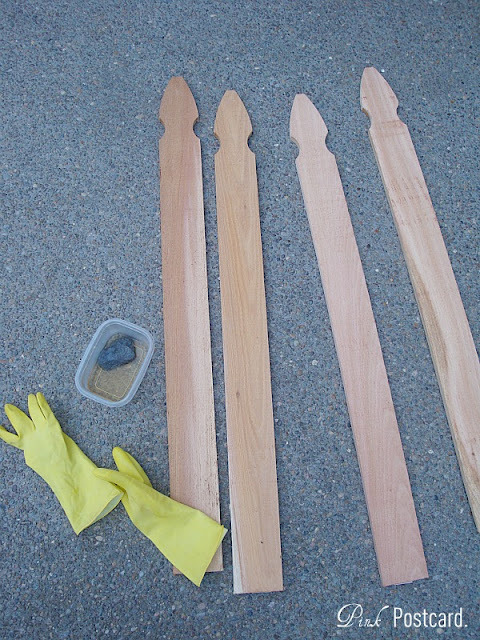 The boards were also a bit stinky, but since I had a few days before the rest of assembly, they were able to air out. 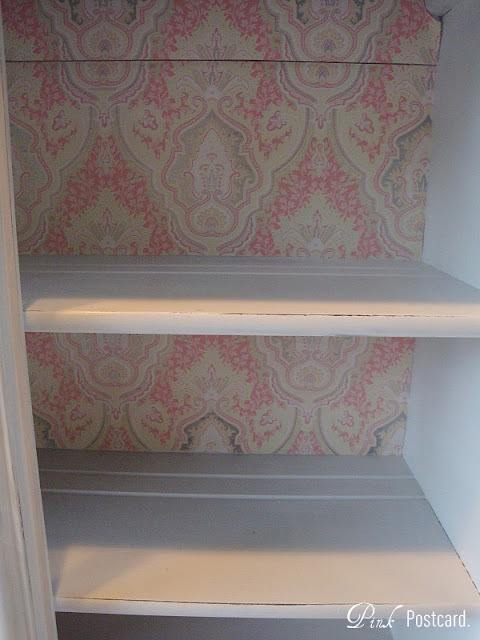 On another note, I never got to do a full before and after on the small hutch! Here was the before when I got it in September. Dark brown, with faux wood grain. I'm not going to criticize the work- whoever did it really did an amazing job. I really thought it was just stained until I started working on it! This one piece, solid maple hutch was so cute. 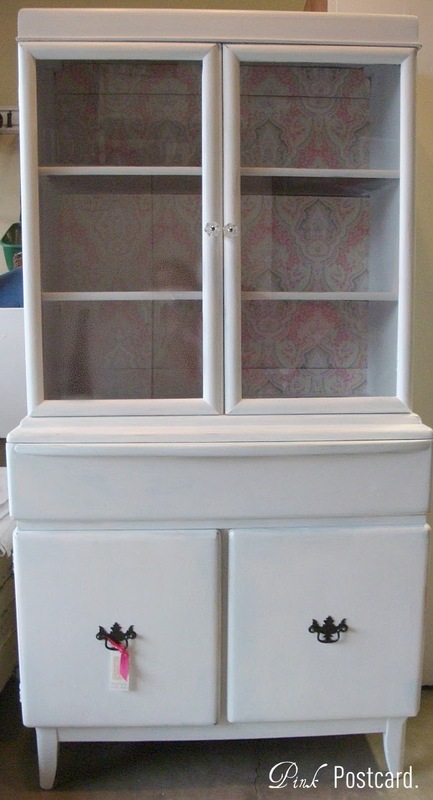 I could see it as a small bookcase or a really pretty linen cabinet in a bathroom. It was missing a piece of glass and one of the pulls. Tons of storage for a five foot piece of furniture. 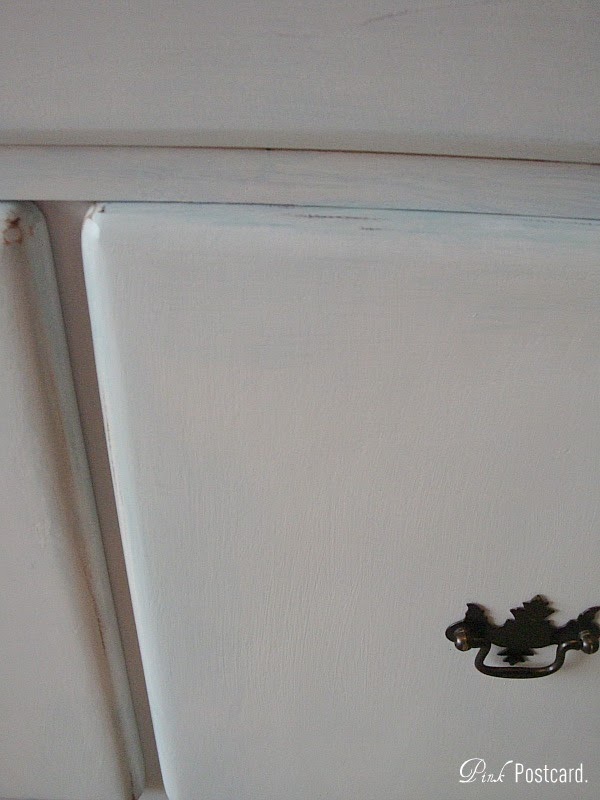 I did a two tone color using milk paint, using Snow White and Baby Blue. A little distressing and some Shabby Chic paper to back the cabinet. The brass pulls also were repainted in an oil rubbed bronze. I really tried to find pulls to replace the one that was missing, but ran out of time in my search before the show. 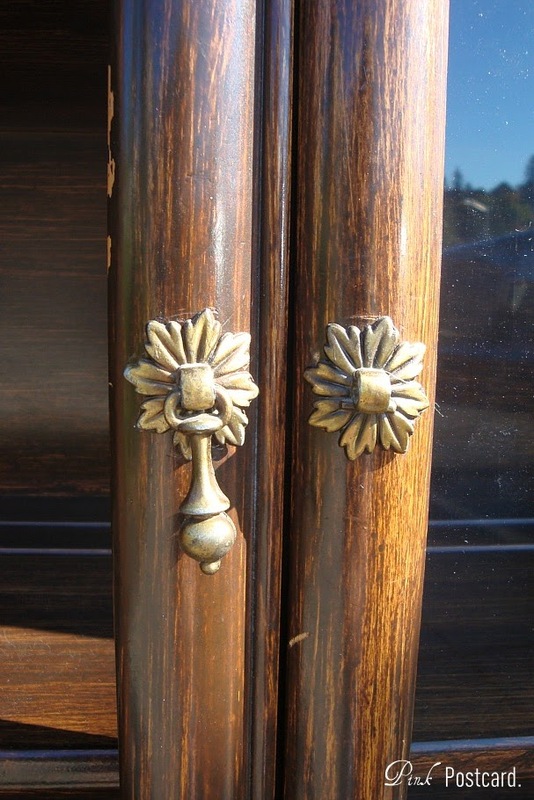 I ended up replacing with glass knobs. They looked nice, but I was really in love with the star burst ones. 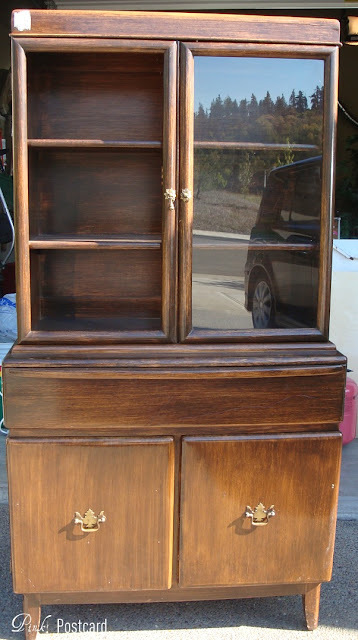 I wish I'd been able to get this hutch truly staged at some point, but this as good as you're going to get! I was nervous about replacing the glass and dragged my feet on it. In the end, it was really no big deal. I won't be so intimidated to do it next time! 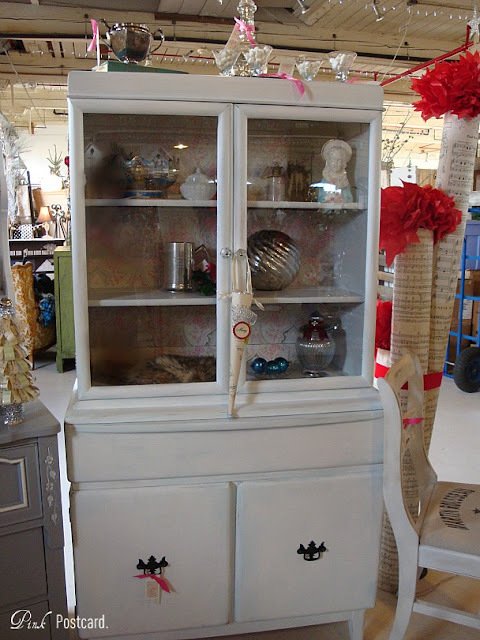 This cute little hutch got lots of interest at the Faire, but I ended up bringing it home. But, over Thanksgiving weekend, it went home with a very nice lady who bought it via Craigslist. And she plans on using it as a linen cabinet for her bathroom! Don't forget~ you still have time to enter my Shabby Apple Dark Secrets of Wonderland bracelet giveaway! It ends tonight at 9pm PST! WOW! 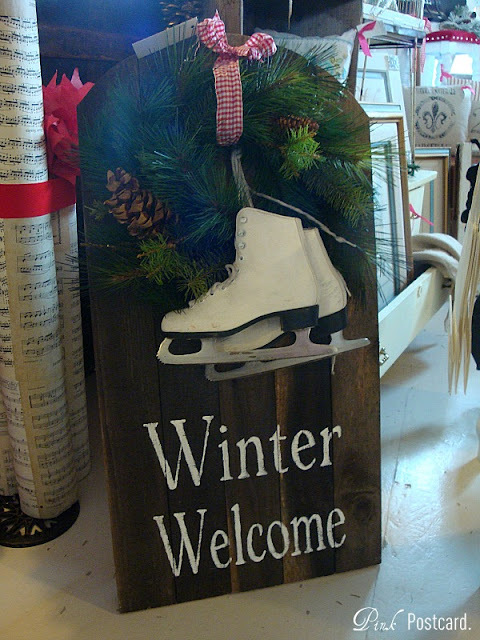 I love the iceskate sign but I love the painted piece even more! What a sweet transformation. Well done! I love the iceskates, too! 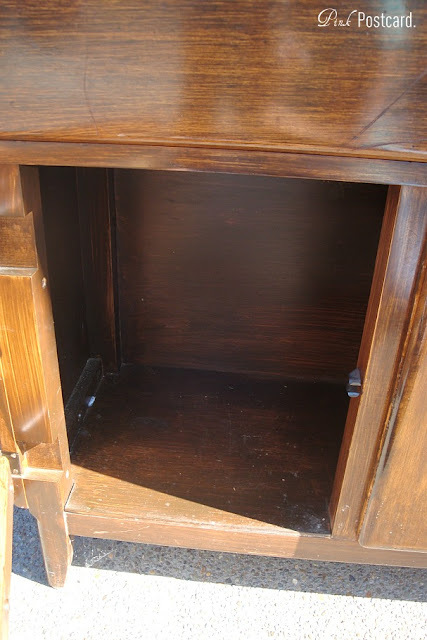 Your hutch turned out really nice. Love the paint! That little white cupboard is going to add so much character in it's new home. I love that winter sled you made! SO cute! I'm going to have to try that apple cider vinegar. The vinegar finish is so pretty - never would have thought that it would do that! 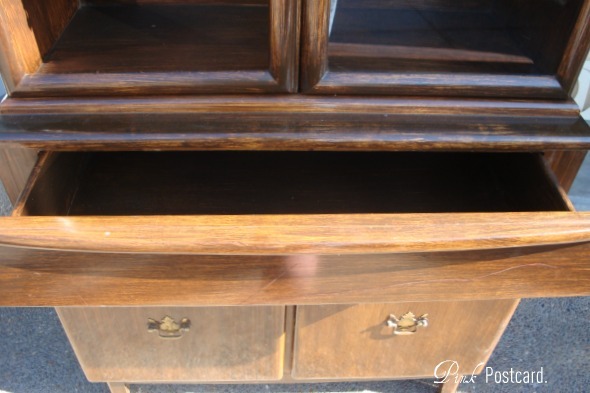 love the makeover on the hutch. Signed up to follow ya! the sled is adorable and so is the cabinet! love the sweet shape of t and the new backing! beautiful as always, denise! Alot of nice projects you did here and my fave "wow" was the new background treatment to the hutch! that winter sign with the iceskates is super cute! my mom has a vintage sled that i'm going to try to use as winter decor, along these lines.